When I can see the botafumeiro running in the Cathedral? The pilgrimage to Santiago de Compostela is filled with a powerful mysticism, And it is a road with breathtaking scenery, customs, traditions and own ceremonies that unite all those who have chosen to live this unforgettable and renewing experience. Those who decided to reach Santiago de Compostela pilgrimage often end up visiting the Cathedral, and embracing the statue of the apostle. According to the season can also witness the ceremony of the botafumeiro. 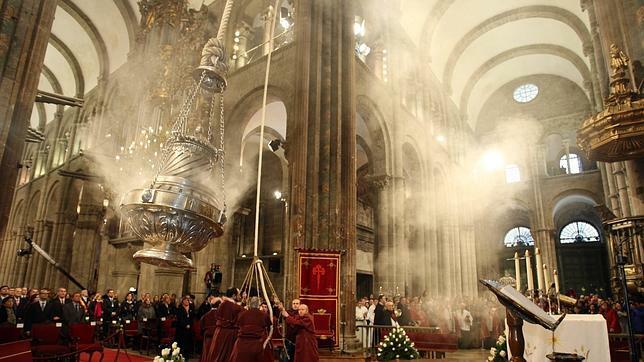 Botafumeiro ceremony is one of the most representative acts by the Cathedral of Santiago, They use a huge old censer large proportions that can measure 1,50 meters and weigh 53 kg. This iconic contraption rises 20 meters in the air with the help of 8 mens, called tiraboleiros. to move, They use a pulley system that is managed by these managers. You can reach the amazing speed 70 km/h. Did you know that the Botafumeiro has timetable for its operation? Do you plan to do the Camino de Santiago or visit the city in summer? At this time of year you can enjoy the botafumeiro ceremony during the Mass for the pilgrims of the 12:00, thanks to an agreement made by the city council, the cathedral and the Hotel Association. The only detail that will prevent you from enjoying the Botafumeiro off dates are not Masses, it is in no Jacobean year, so if your goal is to see this ceremony well you should check your calendar and check the dates that you may be witness to one of the emblematic ceremonies sponsored by the cathedral.